HAHA, PSYCHE, IT’S ACTUALLY THE #1 CARD OF THE SET-wait, it’s not? We really stuck through that whole Top 11 thing, huh? Well then, guess it’s just time to work then. Custom Catcher is an Item that lets you play multiple copies of it at once. If you only play 1, you get to draw until you’ve got 3 cards in hand, but if you play 2, you can switch your opponent’s Active Pokemon with one of their Benched Pokemon. So it’s official – Pokemon Catcher is back in the format. Sure, it requires 2 cards to do that, but it’s not like that stopped Puzzle of Time from being effective, and I doubt Custom Catcher will be any less effective. In fact, it’s going to probably be one of the most impactful Items in the game this year! Even it’s 1-copy effect is good in certain scenarios, but most of the time, you’ll likely see it used to switch something out and KO it with easy. I’m both excited and worried that Custom Catcher is a card. Puzzle of Time got to the point where it was deemed too powerful to see more play in Expanded simply because of the combos that could be pulled off with its effect. And now Custom Catcher offers Lysandre levels of effect for the cost of 2 Items at once. Could Custom Catcher see play over that though? It’s possible, although unlikely; it will take up more deck space, but it doesn’t cost your Supporter for the turn, but when you play something like Lysandre or Guzma, you’re doing it to get something. Still, grabbing whatever you want is pretty powerful. No wonder it made the #2 spot. Arora Notealus: Custom Catcher promises a powerful effect at the cost of Puzzle of Time mechanics, but like I said before, that didn’t prevent Puzzle of Time from being good. Inherently it should, and given that better options are available, you could argue against using Custom Catcher. However, a lot of the better options are Supporters, which means you get caught up with those for the turn, but you could then use Custom Catcher’s draw effect to draw more cards anyway. It’s extremely versatile – don’t overlook that first effect! Weekend Thought: Do you agree with our list? What’s higher on yours? Lower on yours? What else do you have on your list? What do you think will leave the biggest impact? Do you think Custom Catcher will eventually get banned like Puzzle of Time? Or is it a little impractical like Missing Clover? At last, we wrap up the second week of our Top 11 Countdown with our second place pick, Custom Catcher (SM – Lost Thunder 171/214, 231/214). Normally, it would be our first place pick, but we’re doing things a little differently this time. Only a little bit, however; the rest is following our usual guidelines. Custom Catcher is a Trainer-Item that lets you choose between two effects, though you have to meet a specific condition to select the second option. Though it isn’t uncommon for someone to play multiple Trainer cards at the same exact moment, technically they aren’t; you show your opponent two copies of Nest Ball, carry out the search, show them what you fetched, then shuffle your deck and present it to your opponent for further shuffling or being cut to save time because there is no need to sufficiently randomize your deck between searches. A handful of cards, however, truly do allow (or even require) you play multiple copies of a particular card at once. 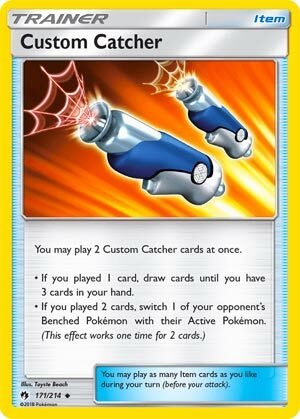 If you play a single copy of Custom Catcher, it lets you draw until you have three cards in hand; if you play two copies at once, you switch one of your opponent’s Benched Pokémon with their Active. Note that if you play two Custom Catcher at once, you only get the switching effect once; you do not get to switch and draw, nor do you get to switch twice. Let us start with the first effect. It is… somewhat good. This is the same as a one-time use of the “Instruct” Ability found on Oranguru (Sun & Moon 113/149; SM – Black Star Promos SM13). Many decks make good use of it, and while it may seem redundant, redundancy isn’t always a bad thing. If your deck is the kind that can rip through your entire hand (or at least get it below three cards) to use Instruct, it can probably make decent (if not good) use another one-time “Draw until you have three cards in hand.” effect. If you actually are ripping through your deck to achieve a particular hand size, such as how a Granbull (SM – Lost Thunder 138/214) wants you to empty your hand entirely so its “All Out” attack hits for 160 damage instead of 30, you probably do not want to get a one-time Instruct from an Item. Now, the selling point of this card is its second effect; there is a reason the original Gust of Wind card was nicknamed “Gust of Win”, why reprinting the same card with a different name as Pokémon Catcher eventually ended with Pokémon Catcher receiving an erratum to its current form (requiring a coin flip to work). This kind of effect now requires a heftier cost, such as being a Supporter (see Lysandre). Custom Catcher is similar to another older card; Poké Blower+. This older Trainer-Item has different wording and a different effect for playing a single copy; flipping a coin and placing a damage counter on the opposing Pokémon of your choice if “heads”, doing nothing if “tails”. I don’t remember this card’s history in detail – I was on hiatus from the game during almost its entire run – but as I understand it, the card wasn’t taken up at first, but eventually did see serious, competitive play before either rotating out or being replaced by the next big thing. I’m also out of time, so let’s just get to the point; this is a good card for certain decks. Basically, the handful that can use the first effect well enough, the new Alolan Ninetales-GX because it can snag two at once, and then Zoroark-GX because it can draw so well that you can probably snag two at once. Even among those, not all will have room for it, but those that do will enjoy a serious advantage. I don’t think you can get by running just two or three of it, due to bad timing or copies getting Prized. Might also be worth it in Expanded, and definitely take it in Limited. One can never get enough Catcher cards! We’ve got Pokémon Catcher which functions like Gust of Wind until the 2013 errata, which makes it act like Pokemon Reversal. Then we got Mega Catcher which acts like Gust of Wind for Mega Evolutions. Afterwards, we got Counter Catcher, which acts like Gust of Wind when you’re behind on prizes. And now, we get to the second best card of the set: Custom Catcher! This is another one of those cards that have two different effects if you decide to invest using that many cards. If you play one Custom Catcher, you draw cards until you have three cards in your hand. If you play two Custom Catchers at once, then it functions like Gust of Wind. Both effects have the potential to be good, except that it competes with other cards that do a similar thing or better. The first effect is compared to Oranguru, whose ability does the same thing, but as long as Oranguru is in play, you can keep doing that once per turn. Custom Catcher’s first effect is a one-time deal due to playing it from your hand. In Expanded, the first effect is outclassed by Bicycle, which draws cards until you have 4 cards in your hand. The second effect could be compared to other cards. Pokemon Catcher relies on a coin flip, but is worth a single deck slot. Counter Catcher is also worth a single deck slot, though being behind on prizes makes it a bit tricky to deal with, especially if you are way ahead than your opponent and want to finish something off. Lysandre and Guzma are Supporter cards, but they don’t fuel up Garbodor’s Trashalanche attack while two uses of Custom Catcher makes it worth 40 more damage that you will take. There’s also Lycanroc-GX from Guardians Rising whose ability functions like Gust of Wind, though the ability is a one-time deal due to working only if you evolve your Rockruff into that card. Also avoids Trashalanche fuel and can still use a Supporter. It’s getting to the point where you would have to run a full four to make the most of it or not at all. If you run two copies, you risk getting one of them in the prize. This is mostly personal preference beyond this point. Each card that competes with each other comes with a fair share of advantages and disadvantages, and it’s up to you to determine which one is safer to use. I used to be excited about this card, but after realizing that you have to have two of those custom catchers to reap the vaunted Gust of Wind effect, it is hard to rely on those on the moment that you’ll actually need it. Thus, my excitement turned into thinking that it’s another decent option in a crowded field. Notes: That wraps it up for this countdown….at least for now. Our first place pick is experiencing technical difficulties, and shall be remedied as soon as possible. In the meantime, enjoy what Lost Thunder has to offer! Custom Catcher (LOT 171) makes its debut in the Lost Thunder expansion set. This Item card carries one of the rarest effects in the game: it allows you to directly draw cards from your deck! I don’t think we’ve had an Item card in format that’s allowed you to do that since Lucky Skates. Custom Catcher essentially functions as Oranguru’s (SUM) Instruct ability: you can draw until you have three cards in hand. PLUS, Custom Catcher has an additional bonus as well: if you play two of these cards at the same time (quite possible with Fairy Ninetales), you can gust up one of the Pokemon on your opponent’s bench and put it into the active position. It’s like a Pokemon Catcher without the coin flip. Again, I’ve got to give more credit to my colleagues here on Pojo for this card. They all rated it much higher than I did. I thought that Oranguru and Guzma still would be better than Custom Catcher. Oranguru you can potentially use every turn. I also figured that it would be difficult to get two Custom Catchers in hand when you needed them to Lysandre / Bloodthirsty Eyes your opponent. But I gave Custom Catchers a shot and made some space for them in a Lost March deck. In the deck that carried Custom Catchers, I went 7 W 3 L. In the ten matches, I played a single Custom Catcher for draw seven times in five of the ten matches. I played two Custom Catchers to gust three times in three games. In four of the six matches, I did not play Custom Catcher even a single time. Then I took the Custom Catchers out and put Oranguru and Guzma back in. In my next ten matches, I benched Oranguru only four times and played Guzma only three times. I also went 7 W 3 L in ten games. So I don’t know what to tell you: are Custom Catchers better than Oranguru and Guzma? I’m just not sure. Maybe they’re better with Fairy Ninetales. Maybe Lost March wasn’t the right deck to test them out in. They probably need more testing. What I am sure of, however, is at this point Custom Catcher is not the best card from Lost Thunder. If they let you straight up draw three cards and not up to three cards, then I’d give them a five and call them the best card in the format today period. Right now, however, I’m tending to think you’re better off sticking with the Banana Master and Your Boy.